Sometimes Foodie: My New Guilty Pleasure Indulgence? My New Guilty Pleasure Indulgence? Pizza flavored snacks are one of my guilty pleasure junk food indulgences, but satisfying ones are getting harder to find. As an adult, I would buy a pizza lunachable here or there to scratch my itch. When they stopped using Tombstone pizza sauce (the monsters! ), I'd go for my favorite bag Doritos which were a combination of pizza and ranch flavored chips. When those disappeared (RIP), I turned to pizza flavored Combos. The Combos are still available, but it is getting harder for me to find the big bags of them. Their slot at my local 7-Eleven has been full of the Cheddar version for a while. 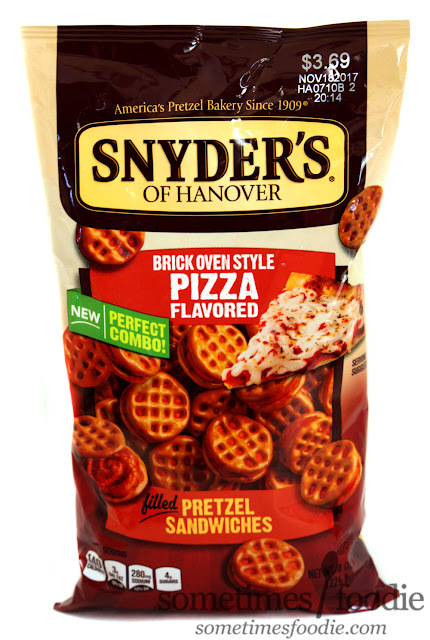 Thankfully, a while back, one of my readers suggested I look into these new Snyder's pretzel sandwiches. It was a rainy day, everyone in the house was feeling under the weather with a slight cold, so I stopped at Walmart to buy some canned soup, and that's when the familiar craving surfaced. I wanted a ketchup-y cafeteria pizza flavored snack and I wanted it NOW. So I went into the chip aisle and finally scored a bag of these. Let's see if these can pass the test! Packaging wise, this leaves Combo's dated design in the dust. The imagery is appealing, the pizza on the front looks like the old, round, Totino's party pizzas I used to inhale after school in the early 2000's, which is exactly the juvenile pizza taste I am after. Also worth noting, there is this snarky little nod to their snacking competition on the green flag to the left. "NEW Perfect Combo!" I see what you did there! Once opened, the bag smells pretty similar to Pizza flavored Combos. You get the savory smell of salty pretzels mixed with an oddly sweet cafeteria-grade pizza sauce. So far, so good. I mean, with pizza flavored snacks you know what you're getting. It's a sweet, ketchup-y, fake pizza flavor that I'm after, and so far, these seem like a safe bet. 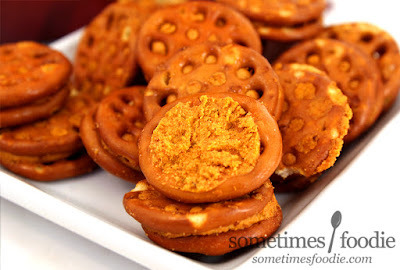 I popped a pretzel wheel into my mouth and at first, these didn't make the cut. The filling was much sweeter than the pizza flavored snacks I was used to, and the pretzel-wheel exterior didn't have any salt. I tend to eat Combos in a specific way, I pop them into my mouth, eat all the salt off the outside, crack them in half, eat the pizza filling, and then crunch away at the empty pretzel shell. These just weren't doing it for me. I served these alongside the soup for a lazy dinner, and my boyfriend and his daughter weren't fans of these either, but you know what? They grew on me! I brought them into work for some desk-snacking, and found myself really enjoying their flavor and the textural experience of prying apart the two pretzel wheels to gain easy access to the tomato, cheese and garlic flavored filling. 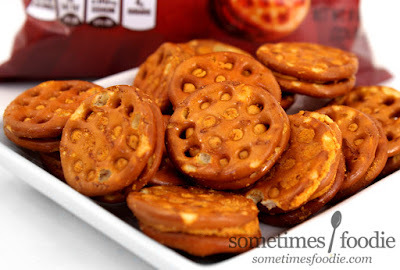 I still think these would benefit from some added salt, for texture, but the pizza flavoring in-between the pretzels totally won me over. I found myself mindlessly snacking away on these at my desk and suddenly, the bag was empty, and I was left wanting more. Which is always a good sign. After giving these a chance, these have earned a slot in my guilty flavor food rotation. Best part is, my boyfriend and his daughter don't care for them, so I can keep them all to myself! Pizza-flavored snack lovers, if you see these around you should definitely give them a try! a few years ago i ate the cheddar cheese version of these all the time. i loved them. ill have to give these a try.